Photo courtesy of Linda Spillers. On a chilly day last winter, Joan Nathan was testing recipes for her latest cookbook,Quiches, Kugels, and Couscous: My Search for Jewish Cooking in France (Knopf), and had me along for the adventure—and a helping hand. “Everything’s ready,” she said after a warm welcome, her black tunic and burgundy sweater vest accented by an intricate silver chain necklace. “Let’s get started.” Out of the industrial stainless-steel refrigerator in her comfortable suburban Washington, D.C., home came leeks, pears, eggs and cream. From the cupboard, dried prunes and a loaf of white bread emerged, along with spices. The double wall ovens purred quietly. Onions, garlic and measuring spoons formed a still life on a well-worn butcher-block counter. Rather than a liability, it may be this self-diagnosed short-attention span, coupled with a deep curiosity about the people she meets and the foods they are eating, that has powered a career now nearly 35 years in the making and with no signs of slowing down. 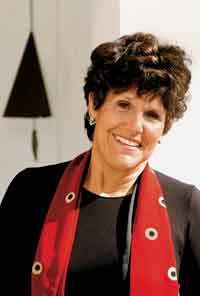 As America’s best-known Jewish cookbook author, she has penned 10 titles including Joan Nathan’s Jewish Holiday Cookbook (Schocken), The Foods of Israel Today and Jewish Cooking in America , the latter two multiple award winners published by Knopf. (She also starred in the PBS television show Jewish Cooking in America.) A regular contributor to The New York Times dining section and an in-demand speaker and guest lecturer, Nathan has done more than carve out a niche; she has created one, lending depth, history and anthropological insight to Jewish cooking around the world. And her culinary interests extend beyond the Jewish realm: Her 2005 The New American Cooking (Knopf) won one of her three James Beard awards. Unlike other cultures, where the Jewish influence on cuisine is more straightforward, Nathan never connected the dots. “I always knew I loved visiting France and felt a connection to the country, but I never thought of French food as particularly Jewish,” she recalled. A trip to Provence, where she uncovered a wealth of historical recipes and documents from locals, changed her mind, and the concept for her latest book was born. What surprised Nathan most was finding Jewish roots dating back as far as the first century. France was an early center of European Jewry, with Sefardim in the south and Ashkenazim in the north. “Both foodways developed simultaneously,” said Nathan, who also learned just how much non-Jews helped Jews endure anti-Semitism, visiting non-Jewish citizens who hid Jews during World War II. “Non-Jews are very familiar with Jewish dietary laws,” she added. In the book, she recounts stories of non-Jewish Michelin-starred chefs with Jewish connections, like Paul Bocuse, who maintains a locked kosher kitchen in his Lyon banquet hall, accessed only by the chief rabbi. It is hard to believe that stories like these remained hidden until Nathan embarked on her book, but those who know her well chalk it up to her irrepressible inquisitiveness, combined with a powerful sense of intuition and intelligence. “What always strikes me about Joan is her curiosity,” said legendary cookbook editor Judith Jones by phone from her home in Vermont. “She smells a story or an experience and she goes after it like a hungry dog.” Jones is a close friend of Nathan’s who, in addition to working with Nathan, has edited luminaries like Julia Child and Marcella Hazan. Nathan’s appreciation for learning was fostered early. Her father, Ernest, a German textiles manufacturer, moved to America just before the stock market crash of 1929 and was able to build a successful business stateside. Nathan’s parents filled their home with music, art and culture, and as a teenager she was sent from Providence, Rhode Island, to live with relatives in Grenoble, France. Nathan also spent her junior year of college in Paris, cementing her love of all things Gallic. But it was the time she spent in Israel that inspired her ultimate career choice. College degree from the University of Michigan under her belt, Nathan moved to Israel in 1970, landing a job as foreign press officer for Jerusalem Mayor Teddy Kollek. Living in Israel opened her eyes to the diversity of Jewish food and led to her first cookbook, The Flavor of Jerusalem, coauthored with Judy Stacey Goldman, which chronicled the different ethnic foodways of the city. While Nathan made many lasting connections in Israel, the most important one was the young attorney she met at the Western Wall—Allen Gerson. They married several years later and lived in New York, Boston and New Haven for a few years while Gerson completed his studies (Nathan also picked up a master’s in public administration from Harvard University) before settling in Washington. An international lawyer in private practice, Gerson initiated the civil suit against Libya on behalf of families of the victims of Pan Am Flight 103 and is active in politics. He is also a photographer whose work is occasionally shown in galleries. Nathan and Gerson have three children: Daniela, a journalist who edits an online newsletter for immigrants in Los Angeles; Merissa, who is currently a student in Jerusalem; and David, an actor who has a private catering business in Brooklyn. Her mother, Pearl Nathan, is 96 and still lives in Providence. If Washington is her yearlong locus of operations, Martha’s Vineyard is her true spiritual home. On a recent visit, Nathan picked me up from the ferry clad in shorts, a bright yellow tank top and white flip-flops, her skin deeply tanned. She and Gerson have been coming here for 32 years, and a few years ago completed construction on a new, sun-drenched home filled with books, a screened-in dining area and stunning views of the water beyond the trees. While on the Vineyard she hikes, plays tennis, swims and bicycles, her kinetic energy transferred from a full workload to a schedule packed with physical and social activities. Still, she is always on the hunt for a story. That morning, Nathan was eagerly awaiting the arrival of a local farmer and woodworker for a consultation on the construction of a grapevine trellis. But this was not just any structure: It was designed to cradle a vine that was a birthday gift from famed chef Alice Waters. When she learned the woodworker’s last name, she immediately identified Portuguese-Jewish roots and within minutes the two of them were poring over cookbooks upstairs in the kitchen. A few nights earlier, Nathan had hosted a dinner party for Jones, who visits her in the Vineyard every summer. “People kept calling to get invited, and we have so many wonderful friends here it’s hard to turn people away,” she said as she sipped coffee in the kitchen. Watching Nathan pull four types of homemade preserves from her refrigerator (courtesy of a generous neighbor) before picking fresh herbs from her patio is to witness a food professional in a moment of pure cooking bliss. “Why don’t you grab some more Swiss chard from the garden?” asked Nathan as she put the remnants of a home-baked loaf of bread, some French butter and a carton of farm-stand eggs on the counter. For a few moments, there was no talk of work, recipe developing, deadlines or book parties. Just scrambled eggs with fresh-picked basil, sauteed greens with shallots, toast with blackberry jam, morning sunshine and piping-hot coffee. From Quiches, Kugels, and Couscous (Knopf). 1. Preheat oven to 300°. Liberally coat each side of the cod with sea salt, about 3 tablespoons in all, and let rest for 15 minutes. Rinse the cod with cold water and pat dry with paper towels. 2. Place cod in an 8×12-inch baking dish or jelly-roll pan. Pour olive oil and milk over it and lay thyme sprigs and garlic on top. Cover with aluminum foil and cook for 20 minutes, until the fish begins to flake. Remove from oven, reserving the thyme and cooking liquid. Discard garlic. 3. Meanwhile, put the potatoes in a large pot of cold water and season with 2 tablespoons sea salt. Bring to a boil and cook potatoes until a knife passes effortlessly through them. Strain in a colander and return to pot, cooking over very low heat for about 4 minutes to get rid of excess moisture. Remove from heat and mash until smooth. 4. Lightly beat the egg in a large bowl. Stir the mashed potatoes, little by little, into the egg. Add the leaves of the reserved thyme. Using a fork, flake the cod and then fold it into the mashed potatoes. If the batter is too stiff, mix 1/4-1/2 cup of reserved cooking liquid into batter. If batter is too thin, add 1/4 cup matza meal. Season with salt and pepper to taste. Cover and refrigerate for 30 minutes.